to the residents of Golden Arms Apartments. Angus Carter spent most of his adult life in prison. I grew up in Baton Rouge, Louisiana, Angus says. It's a pretty rough little city. "I grew up in a tough neighborhood. I never had any direction or guidance, and I was a juvenile delinquent. I used drugs, and I was always in trouble. I wound up going to prison for ten years, then I was released on parole. But I violated parole by crossing the state line without permission, so then I was incarcerated for another four years and eight months." "Most people think of prison in a totally negative light,Angus says. But for me, prison was a blessing in disguise. In prison, I had mentors for the first time. I did a lot of reading and tried to educate myself." When I was in prison, I knew I had HIV,Angus says. I had plenty of time to think, and HIV gave me something to think about. I read about AIDS activists giving a voice to people who had no voice. I started wanting to be somebody and do something. I wanted to be an AIDS warrior when I got out. I figured I could go out on the street, tell people I had HIV, and say, I used to shoot drugs with you. I talked to you then, can I talk to you now? When Angus was released he had to make a detour to the Emergency Room before he could begin his career as an AIDS activist - but that detour, ironically, led him straight to the right people to help him get his career as an AIDS warrior started. They gave me the phone number for the Southwest Louisiana AIDS Council when I was released from prison, Angus says. While we were waiting in the Emergency Room, I asked my wife to call and see what they were all about. One of their case managers, Karla Weir, was in the emergency room before I was even admitted to the hospital. When I got out of the hospital, I had lost ten pounds, and I was confused. Karla Weir took charge. She knew about things that I was entitled to that I had never heard about.She set me up with my Social Security and Medicaid. I don't know what I would have done without her. SLAC also took Angus under their wing and gave him his first opportunities to get involved in AIDS activism. Angus has a real passion for advocacy, says Terry Estes, the Executive Director of SLAC. He's made a real difference, especially in the African-American community. He's not afraid to put himself out there and contact people. Advocacy has given him an identity beyond just being a prisoner. 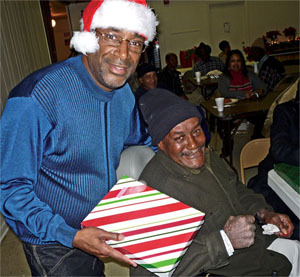 His past has now become a gift that he uses to help other people. Since Angus was released from prison two-and-a-half years ago, he has raised funds to produce and run radio and TV commercials encouraging people to get tested for HIV. He has had his own radio talk show. He started his own nonprofit, the Carter Foundation. He has acknowledged those who have contributed to the fight against HIV and AIDS with special Community Service Awards. In addition, he has "adopted" two local community services organizations, the Golden Arms Apartments and Mama Rose's Day Care Center. "The people who live at the Golden Arms are elderly or disabled, Angus said. "Most of them get their meals from 'Meals on Wheels,' but 'Meals on Wheels' only operates on weekdays. Many of them were simply going hungry on the weekends. So, for the last 15 months, we've been going in to feed them on weekends. I have a real good staff of cooks. We have music playing, we dance after we eat. And, after all the dishes are cleared away, we put out boxes of fresh fruit and produce. They can take their bags and fill them up, and it's all free." Says Mama Rose of Mama Rose's Day Care Center, I thank God for putting people like Angus Carter and his wife Charlotte in our lives. Our kid's parents don't have much money. For some of our kids, the only good meal they get all day is the one they get here. I'm an old-fashioned 'scratch' cook. The Carter Foundation brings me fresh fruit and fresh vegetables. I make apple pie, I make fruit smoothies for the kids. Angus and Charlotte come by and read stories to the children. Sometimes they bring little toys for the kids to play with. They are a blessing." "It has taken a while for Angus to recover, both physically and mentally,says SLAC Executive Director Terry Estes. He still has medical issues. He's had a couple of surgeries since he was released from prison. But he carries on, even when he's sick and down. He's a miracle."